It looks as though Microsoft could be in for a bit of a shake-up if the latest memo from their CEO is anything to go by. In a letter written to employees, Satya Nadella said he and his counterparts are taking some “important steps to visibly change our culture” and mentioned other new mantras for employees, such as to “obsess over customers”. Titled, ‘Bold Ambition & Our Core’, the memo stated the company’s culture should strive towards all employees “making Microsoft the best place for smart, curious, ambitious people to do their best work”. He also promised his staff streamlined processes to reduce the amount of time and energy spent, and can “expect to have fewer processes but more focused and measurable outcomes”. Microsoft employees can also expect better training, learning and experimentation as the company aims to provide more opportunities to test ideas and incubate new projects. “All of this, too, comes with accountability and the need to deliver great work for customers, but it is clear that investing in future learning and growth has great benefit for everyone,” Nadella wrote. “We have clarity in purpose to empower every individual and organisation to do more and achieve more. We have the right capabilities to reinvent productivity and platforms for the mobile-first and cloud-first world. 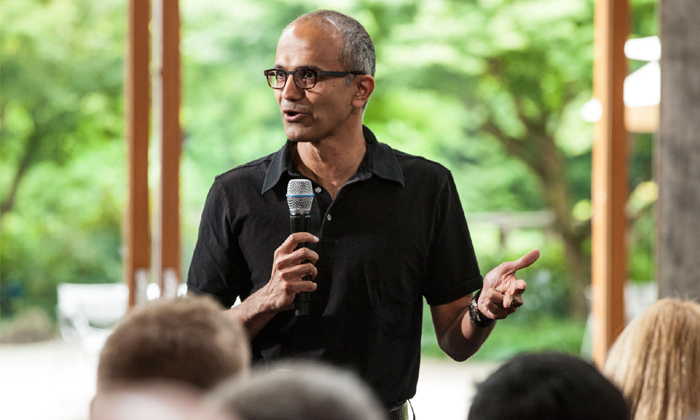 Nadella also called for the company to focus on productivity – both internally and externally. “More recently, we have described ourselves as a ‘devices and services’ company. While the devices and services description was helpful in starting our transformation, we now need to hone in on our unique strategy,” he wrote.